You want to increase your site ranking and organic traffic right, the secrete is not always been told by top bloggers and marketers. Every average blogger want to get high traffic to his blog and reach the top of search engine result page SERP. 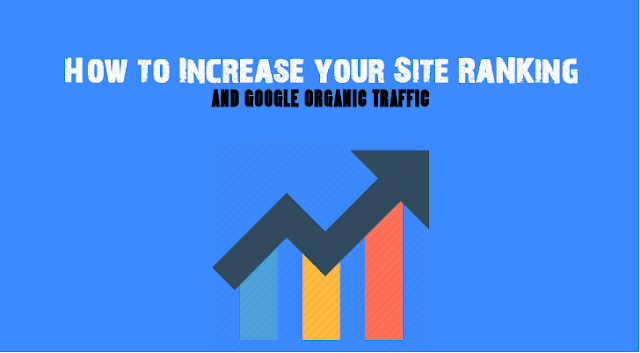 In this post am going to reveal the best strategy to use and increase your site ranking and traffic. You want to increase your site ranking and organic traffic right, the secrete is not always been told by top bloggers and marketers. Every average blogger want to get high traffic to his blog and reach the top of search engine result page SERP. In this post am going to reveal the best strategy to use and increase your site ranking and traffic. It is difficult to place all the content requirement in place when we talk about content relevant. Some bloggers are not good in article writing but that is one of the good characteristic of blogging, so you have to start reading and learning how to write good blog post. I use to write my article after voicing it out because I believe that I put more words when am teaching orally. To produce relevant optimize content, you have to explain your keyword or point clearly for your readers to understand, not only enough words but with images to help explain better. The fact is that in content marketing today, indept post are still the rulling king, you engage customers by rewriting old post to add more value or adding new post that touches customer pain point. For example a post with a thousand words without image Is much more boring than a post with two thousand words with images explaining each point. Keyword research is the process of finding the actual search terms that people enter into search engines. The knowledge about these actual search terms can help inform content strategy, or marketing strategy. Find the words that is general and shorter that people are searching, it is always competitive. Focus on long-tail keyword, it is word that is more about the niche not the mass audience, it is less competitive. because of that they provide both long term and short term benefit. Make use of some keyword tools like google planner to get as much keyword as you like. Most of the bloggers do not invest in this area for solid results fast. Perhaps your site takes more time to get loaded, sites front-end design is not worthy enough, ignoring technical issues, and so on. Solution: All you need to build a trustiest look and using a hosting server that it doesn't late to appear your site. When we talk about SEO, page ranking has upper hand than traffic, most of bloggers don't consider some important SEO tips and tricks which need to be done after publishing a post. SEO ranges from internal linking (on-page SEO) to off page SEO,black hat to white hat. Even though google ranking factor also depend on how many site linked to your post called backlink. Plus keywords. According to Bill Slawski tweet, he explain the main factors that determines new ranking factors. Metadata which is either title post headline or your post descriptions, when the Google search is related to your post tittle than you will likely increase your rank. The fact is that content update or rewriting increases traffic to a site. As a blogger, content update is very important. It show google algorithms that your blog is relevant, new information is added or your post are always updated. Most perhaps you do not post consistently and no presence in the potential traffic zones of Social media can create huge drawback to find traffic. Solution: You engage, traffic will engage. Try to optimize your Social Media Channels for better performance for referral traffic. There are many other reasons, such as you are ignoring Google Analytics, not emphasizing on relationship marketing, not paying time to build users community, not taking benefits of automated marketing, not taking curated content marketing opportunity to drive traffic, and so on. All of these troubles can be fixed while you go through these best practice blogging habits. Also to rank high in google search engine result page, always write great content, consider keyword research as an important aspect to give your post tittle awesome headline, update with new or former content, consider internal linking (on page SEO).